"Purveyors of Quality Artemia Cysts"
"Golden Pearls" is a revolutionary new larval diet that is currently experiencing great success in marine fish and shrimp hatcheries worldwide. The secret to its success is an innovative manufacturing process which involves the agglomeration of micro-encapsulated particles that "traps" tiny air pockets inside of the feed particles. This results in a "non-sinking" particle diet that remains suspended in the larvae tank. The introduction of Golden Pearls has significantly reduced the dependence, and in some cases, replaced live feeds (rotifers and Artemia nauplii) in commercial marine fish and shrimp hatcheries. Ingredients: High quality fish meals, crustacean meal, purified fish oils, phospholipids, astaxanthin, vitamins and protected minerals, antioxidants, and immunostimulants. Analysis: Protein - 60%, Lipids - 8%, Ash - 15%, Moisture - 8%, Vit C - 2000 ppm, Vit E - 400 ppm, Astaxanthin - 500 ppm. Storage and Packaging: All Golden Pearl particle sizes are "nitrogen flushed" into one kilo, vapor-barrier foil bags. There are 12-pouches per case. Once opened, the product should be resealed and stored under cool, dry conditions. 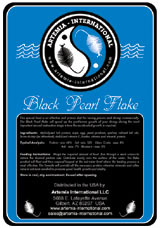 Our Black Pearl Artemia flake diet contains 100% Artemia biomass and is made fresh when an order is received. This high protein feed is an excellent post-larval diet for P. monodon and P. vannamei as a crumble. Color is dark brown but other color variations are available upon request. Other essential ingredients include immuno-stimulants, astaxanthin, stabilized vitamin C, and lipids. This flake does not cloud the culture water. Storage and Packaging: Made fresh upon receipt of order. Packed in airtight, 5 gallon plastic buckets (4 kilos per bucket). Instant Algae™ is produced from highly concentrated, monoculture marine microalgae. It is grown in a high-tech, tightly controlled photo bioreactor system where sources of contamination are eliminated. The paste can easily be reconstituted by mixing it with either fresh or salt water. Simply shake or blend the concentrate into a small quantity of water and feed it directly to your tank. With minimal circulation the microalgae will remain suspended and is easily available to your animals. By mixing two or more cultures together you can create a wide variety of nutritional mixes, allowing you to find the optimal diet for your animals. Inland Seafarm microalgae concentrate can be used as either a primary or backup food source. As a primary food source microalgae concentrate is an excellent source of nutrition and readily accepted by zooplankton, shellfish larvae, and shrimp larvae. In tests it has shown to be up to 100% as effective as live microalgae culture. It is also very convenient to use, easy to measure, and can be much more cost effective than growing your own microalgae. If you are producing your own microalgae and are concerned about maintaining a consistent food supply, Instant Algae™ can be your "insurance". Microalgae cultures can be very difficult to maintain and "crash" easily. By keeping a supply of Instant Algae™ in your freezer you will have a ready source of microalgae until you can get your own cultures back on line. Note: Instant Algae™ is not a starter culture. Centrifuging and chilling the cells make it impossible for them to reproduce. Instant Algae™ is grown under lab conditions in a completely closed system. The water is filtered, purified, and sterilized to eliminate and remove all contaminants. It is certified 100% free from viruses, toxins, and heavy metals. Nutrient Rich - Grown in Cold Water Microalgae that is grown in cold water has a much higher nutritional profile than microalgae grown in warm water. Our microalgae is grown in water that varies from 16C to 22C, depending on the culture. Storage and Packaging: Instant Algae™ has been cryopreserved to give it a 1 year + frozen shelf life while retaining properties and nutrition similar to live microalgae. It must be kept frozen (a standard freezer is ok) and has a liquid viscosity, making it very easy to work with. The algae is packed in one liter, leak-proof pouches. There are 10 liters per Styrofoam box. Spirulina algae is widely used in fish and shrimp hatcheries as both a direct feed and a feed supplement. For shrimp larvae, spirulina is commonly used as phytoplankton supplement during the early larval stages. As a feed supplement, Spirulina contributes carotenoids and xanthophylls for added coloration, vitamins, minerals, and provides immune enhancement in fish. Artemia International recommends a 2-5% inclusion rate. Protein, 60%; Lipids, 6%; Minerals, 8%; Moisture, 7%. SELCO (self emulsified liquid concentrate) was developed by Artemia Systems in Belgium and has been the benchmark enrichment formula to the aquaculture industry since the mid-1980's. This Artemia or rotifer enrichment formula is rich in HUFA (highly unsaturated fatty acids) and is super concentrated. .3 grams (~10 drops) per liter or quart of water is sufficient for enriching hundreds of thousands of Artemia nauplii and adults as well as rotifers. Storage and Packaging: SELCO is available in 1-kg bottles, 9-bottles per case. SELCO has a shelf life of 12-months from the date of manufacture. Product should be stored in a cool, dark and dry environment (4-15 degrees Celsius). Once opened, product should be used within a one month and stored in a refrigeration type temperatures. Do not freeze. Completely soluble in freshwater and saltwater. Non-toxic and approved for use on aquatic animals intended for human consumption. ClorAm-X is used around the world for bulk live transport of fish, shrimp, and shellfish. By reducing the amount of free ammonia in the water transportation times can be significantly longer without injury to the animals. ClorAm-X can completely replace the biofilter in a 90% recirculating system. It can be used to enhance biofiltration in any system since it will not disrupt the natural biofilter. ClorAm-X can be added to the media when shipping any type of live organism to reduce stress and increase survival rates. We add ClorAm-X to our live rotifer shipments and have survival up to 14 days.